BMW E21 bumper ( BMW E21 Stoßfänger ) by stainless steel (1975 - 1983) One set includes: 1 front bumper in 3 parts and 2 pcs joining strips, 1 rear bumper in 3 parts and 2 pcs joining strips and mounting kit The bumper is copied from the original in shape, size and is perfectly comparable to the original bumper. Australia’s best value weighbridge supplier on the market selling weighbridge packages throughout Australia and Internationally. Our weighbridges provide customers with affordable options for accurate mass management while complying with legal requirements and maximising efficiencies within their business. Volkswagen Type 3 bumpers (VW Typ 3 Stoßfänger) 1963 - 1969 in stainless steel One set includes: 1 front bumper and 2 over riders, 1 rear bumper and 2 over riders and mounting kit. Bumper are made of one the best solid stainless steel SAE 304 which never gets rusty, 1.5-2mm thickness and Surface is polished bright mirror, Inside is painted 3 layers. Volkswagen Type 3 bumper (VW Typ 3 Stoßfänger) type 1970-1973 in stainless steel One set include 1 front bumper, 1 rear bumper and mounting kit. Bumper are made of one the best solid stainless steel SAE 304 which never gets rusty, 1.5-2mm thickness and Surface is polished bright mirror, Inside is painted 3 layers. Mercedes W186 300, 300b and 300c bumper (Mercedes W186 300 Stoßfänger) 1951-1957 by stainless steel One set include: 1 front bumper in 3 parts and 2 over riders 1 rear bumper with 2 over riders Mounting kit Bumper are made of one the best solid stainless steel SAE 304 which never gets rusty, 1. Mercedes W170s bumper (Mercedes W170s Stoßfänger ) years 1935-1955 in stainless steel One set bumper includes: 1 front bumper, 2 overriders and 2 trim embellishers. 1 rear bumper, 2 overriders and 2 trim embellishers. Mounting kit ( bolts, screws ) Link Youtube: https://www.youtube.com/watch?v=hLZB6m52dlc&feature=youtu. Mercedes W136 170 Vb bumper (Mercedes W136 170 Vb Stoßfänger) 1952 – 1953 by stainless steel One set include: 1 front bumper in 3 parts and 1 rear bumper in 3 parts Mounting kit (bolts, screws) Bumper are made of one the best solid stainless steel SAE 304 which never gets rusty, 1.5-2mm thickness and Surface is polished bright mirror, inside is painted 3 layers. Lancia Flaminia Pininfarina coupe (Lancia Flaminia Pininfarina Coupé Stoßfänger) year (1958-1967) stainless steel One set include: 1 front bumper 3 parts and 2 over riders, 1 rear bumper 3 parts, 2 over riders and mounting kit. Bumper are made of one the best solid stainless steel SAE 304 which never gets rusty, 1. Fiat 124 Spider bumper (Fiat 124 Spider Stoßfänger) 1966 – 1975 in stainless steel One set includes : 1 front bumper and 1 rear bumper ( 2 parts), mounting kit Bumper are made of one the best solid stainless steel SAE 304 which never gets rusty, 1.5-2mm thickness and Surface is polished bright mirror, inside is painted 3 layers. BMW 2800 CS bumper (BMW 2800 Stoßfänger) stainless steel (1968-1975) One set includer: 1 front bumper in 3 parts and 2 over-riders, 1 rear bumper in 2 parts and mouting kit. Bumper are made of one the best solid stainless steel SAE 304 which never gets rusty, 1.5-2mm thickness and Surface is polished bright mirror, Inside is painted 3 layers. Rolls-Royce Bentley S1, S2 bumper (Rolls-Royce Bentley S1, S2 Stoßfänger) stainless steel (1955-1962) One set includes: 1 front bumper and 2 overriders, 1 rear bumper and 2 overriders. Mounting kit Please see video of Stainless steel bumper Bentley S1, S2 https://www.youtube.com/watch?v=LexgqfvK-ns https://www. Alfa Romeo Sprint (Alfa Romeo Sprint Stoßfänger) year (1954-1962) bumper stainless steel One set include: 1 front bumper, 1 rear bumper in 3 parts and mounting kit. Bumper are made of one the best solid stainless steel SAE 304 which never gets rusty, 1.5-2mm thickness and Surface is polished bright mirror, inside is painted 3 layers. Volvo PV Duett Kombi bumper ( Volvo PV Duett Kombi Stoßfänger ) stainless steel (1953-1969) One set include: 1 front bumper in 3 parts, 2 overriders , 2 rear corner bumpers and mouting kit. 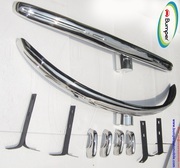 Bumper are made of one the best solid stainless steel SAE 304 which never gets rusty, 1.5-2mm thickness and Surface is polished bright mirror, inside is painted 3 layers. Volvo PV 444 bumper (Volvo PV 444 Stoßfänger) in stainless steel (1947-1958) One set include: 1 front bumper in 3 parts, 2 overriders 1 rear bumper in 3 parts, 2 overriders, 1 rear bar Mounting Kit. Bumper are made of one the best solid stainless steel SAE 304 which never gets rusty, 1.5-2mm thickness and Surface is polished bright mirror, Inside is painted 3 layers. Volkswagen Karmann Ghia Type 34 bumper (VW Karmann Ghia Type 34 stoßfänger) stainless steel (1962-1969) One set includes: 1 front bumper in 3 parts, 2 overrider; 1 rear bumper in 3 parts, 2 overriders mounting kit. Bumper are made of one the best solid stainless steel SAE 304 which never gets rusty, 1. Volkswagen Beetle Split bumper (VW Käfer Split Stoßfänger) stainless steel (1930 – 1956) One set includes 1 front bumper and 2 overriders, 1 rear bumper, 2 overriders, steel bracket (4pcs ), and mounting kit Bumper are made of one the best solid stainless steel SAE 304 which never gets rusty, 1. Volkswagen Beetle bumpers 1975 and onwards (VW Käfer Stoßfänger satz ab 1975) by stainless steel One set include : 1 front bumper, 1 rear bumper and mounting kit Bumper are made of one the best solid stainless steel SAE 304 which never gets rusty, 1.5-2mm thickness and Surface is polished bright mirror, inside is painted 3 layers. Triumph Spitfire MK4 (1970-1974), Spitfire 1500 (1974-1980), and GT6 MK3 (1970-1973) bumper (Triumph Spitfire MK4, MK3 GT6, 1500 Stoßfänger) stainless steel One set includes : Kit consists of 1 front bumper and 1 rear bumper Link Youtobe: https://www.youtube.com/watch?v=Rlko54E-aO0 Bumper are made of one the best solid stainless steel SAE 304 which never gets rusty, 1. Opel GT bumper ( Opel GT Stoßfänger ) stainless steel (1968–1973) 1 set includes: 1 front bumper, 2 halves rear bumpers, 4 overriders and mounting kit The bumper is copied from the original in shape, size and is perfectly comparable to the original bumper. The bumper is made from 304 stainless steel (it never rust, even at different temperatures), After the bumper is finished, it is polished to high gloss. Mercedes W123 Sedan bumper ( Mercedes W123 Sedan stoßfänger ) 1976 – 1985 stainless steel One set include: Front bumper with rubber ( 2 pc ) Rear bumper with rubber Mounting kit: bolts, nut. Link Youtube: https://www.youtube.com/watch?v=lETSnshltz4 Bumper are made of one the best solid stainless steel SAE 304 which never gets rusty, 1. Mercedes W120 W121 bumpers 180B, 180C, 180DB, 180DC, 190B, 190DB bumper (Mercedes-Benz 180 190 Ponton W120/W121 stoßfänger) stainless steel (1959-1962) One set include: 1 front bumper in 2 parts, 2 over riders and trim. 1 rear bumper in 2 parts, 2 over riders and trim, Mouting kit ( bolts, nuts ) Bumper are made of one the best solid stainless steel SAE 304 which never gets rusty, 1. Mercedes Ponton 220S W105 W180 W128 models 220A, 220S, 220SE, 219 bumper (Mercedes Ponton 220S Stoßfänger) 1954-1960 by stainless steel One set include: 1 front bumper in 3 parts and 2 over riders 1 rear bumper in 3 parts and 2 over riders Mounting kit: bolts, nuts. Link Youtube: https://www. Freedom Mobility, New Mobility Scooters, Electric Mobility Scooters, Cheap mobility scooters and Best mobility Scooter Accessories in Melbourne, Australia. For More Info:- https://freedommobilityscooters.com.au/. Vehicles Australia ads Australia, Vehicles classifieds Australia, Vehicles free ads Australia, ads for sale Australia, ads to buy Australia, FREEADSAustralia Page number 3-1. Find here ads for sale, to buy and rent in Australia. Goods for sale in Australia, vehicles for sale in Australia, Australia real estate for sale, Australia property for sale, property for rent in Australia, business ads in Australia, Australia business classifieds, services in Australia, Australia services ads, jobs in Australia, pets for sale in Australia, Australia dating, Australia cars for sale.